The Solar LED Home Lighting available in 1/2/3/5/7/9 Wattages- Home lights comes with Led tube light half Aluminum and half Polycarbonate Cover material, retrofitted on PVC fitting easily mountable on the walls. 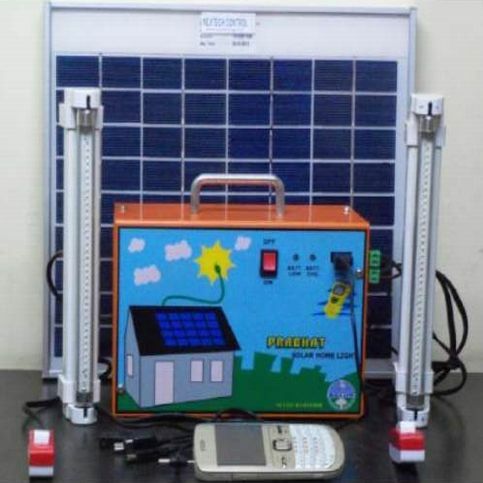 Home lights is easily operate with Solar panel and Battery and gives the Autonomy of 3 days. Powered by Nichia Japan Leds. 3W Two tube light mobile charging point with cable 6 in 1 lead 1.5 feet length. Long back up time with constant output of the light. Full protection against overloading, over charging, over discharging, over load and short circuit, reverse protection. Constant current technique to utilize the 100% of Led life without any degradation. Polycarbonate transparent scratch free covers of tube light weight and non-breakable. Easy installation With Wall mounting brackets on Led tube lights. 1 year warranty of Any Manufacturing defect.